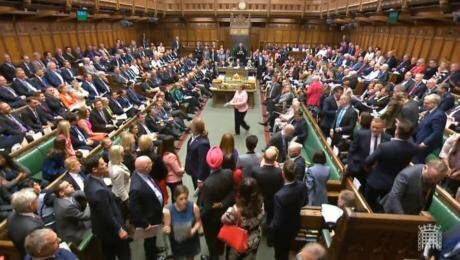 Image: SNP MPs walk out of the Commons in June 2018 in protest at not being allowed time to debate amendments to the Withdrawal Act. Credit: PA Images/All rights reserved. Scotland’s aristocratic and middle classes have long told themselves that thanks to the successful wars of independence (and of course, the icons of Wallace and Bruce), Scotland and England came together as two equal partners – first in the union of the crowns and then through a political union – rather than through conquest and subjection. It was a theme which would re-emerge during the 2014 independence referendum with the slogan that “Scotland should lead not leave” the UK in a partnership of equals. The Brexit process has told voters in Scotland much about the nature of Devolution and Scotland’s standing in the partnership within the union of the UK. Whatever the UK is, it’s not a union of equals – and Scotland’s standing in the UK contrasts strongly with the status and standing of our Celtic cousin Ireland in the union of the EU. Brexit for the Scots has been a tale of two unions. Scotland voted to remain in the EU by 62% – 75% in the City of Edinburgh, part of which I represent. Every local authority area in Scotland backed remain. Polls now show an even larger remain vote across Scotland, in the region of 70%. The majority of Scottish voters do not hold the same concerns about sovereignty or immigration as are held by English voters. Scotland’s historic ties with the European continent have much to do with this – but so does devolution. Scotland has to an extent been protected from the worst excesses of austerity because we have had left of centre devolved Governments since 1999. Throughout the austerity years, an SNP Government has tried to protect Scotland and currently spends £125m a year to ameliorate the worst of Westminster’s social welfare cuts. It is also a matter of record that Scotland has the best performing NHS in the UK. There has been considerable investment in social housing, ground-breaking homelessness legislation and the re-introduction of security of tenure in the private rented sector. By contrast many working-class people in England have been led to believe that the cause of their difficulties getting a house or a well-paid job is immigration, rather than government policies. But back to the tale of two Unions. So far as Ireland (north and south) is concerned, British politicians largely overlooked the threat that Brexit posed to the Good Friday agreement until after the referendum. And even then, many of them – particularly in the Tory party – remained (and remain) unable to accept the reality of the legal obligations that the United Kingdom undertook in that agreement. However, because the EU27 got behind the Irish Government’s legitimate concerns, these concerns became central to the Brexit process. In stark contrast, the legitimate concerns of the Scottish Government and the Scottish Parliament have been wholly ignored by Westminster. Let us look at what has happened to Scotland in the past two years. The Scottish Government put forward the idea for a differentiated deal or a compromise for the whole of the United Kingdom at an early stage, but that was completely ignored. The UK Government cut the Scottish Government out of the Brexit negotiations entirely. The Scottish Parliament voted—with the cross-party support of everyone apart from the Tories and one Lib Dem—to withhold consent to the European Union (Withdrawal) Bill, but that, too, was ignored. When the Scottish Parliament tried to pass its own Legal Continuity Bill, dealing with the consequences of Brexit for devolution, it was challenged by the British Government in the UK Supreme Court, and while the hearing of the case was pending before the court, in the House of Lords the Tories retrospectively changed the law to make large parts of the Bill ultra vires. When amendments to the Withdrawal Bill came back from the House of Lords to House of Commons, Scottish MPs got 19 minutes to debate the implications of those amendments, with all of the time being taken up by the Government Minister. That’s what prompted the SNP walkout. Scotland is not mentioned in the Withdrawal Agreement or the Political Declaration. Gibraltar was afforded advance sight of the agreement. The Scottish Government saw it only when the rest of us did. At the time of writing Westminster is in deadlock and the UK Government is in office but not in power. Theresa May’s belated soundbites about reaching out appear not to have lasted long. But the idea of a temporary cross-party government formed for the purpose of extending Article 50 in order to seek a second EU Referendum, revoke Article 50 and then hold a General Election is gaining increasing currency. For the SNP to take their rightful place in that Government as the third party at Westminster and the Government of Scotland, two things would have to be recognised. Firstly, in contrast to the last 2 and a half years, Scotland’s interests must be centre stage and put on an equal footing with those of England, Wales and Northern Ireland. Secondly, it would need to be acknowledged that the Brexit process has created a mandate for a second independence referendum and that the Scottish Parliament should be given the means to hold a legitimate constitutional referendum when it judges the time is right. The votes of SNP MPs at Westminster will be vital. We have already been a pivotal part of the cross-party working that has led to defeats of the current Tory Government. We have shown we can work in interests of all nations of these islands. However, Scotland must be promoted from the back seat to the front seat of British politics. I am quite sure if there is a second EU vote Scotland will vote again to remain. I sincerely hope England will too – but if it does not, the demand for a second independence referendum in Scotland will be irresistible. The precedent of a second vote when circumstances change will have been set. This time, we know that Scotland will have a far more sympathetic ear in Europe, even from the Spanish, supposedly Scottish Independence’s greatest foes in the EU. Their Foreign Minister has again reiterated strongly that if Scotland secedes from the UK constitutionally, he will not veto Scotland’s membership of the European Union. To conclude, the Brexit process has shown the difference between what it means to be a member of the United Kingdom and a member of the European Union. The Scots have been left in no doubt that the assurance they were an equal partner in the UK was untrue. At the same time they have seen what true equal partnership means for Ireland in the EU. So regardless of what happens with Brexit, I believe that the Scots will soon take the opportunity to say that Scotland’s position in the UK Union is not tolerable. We want to take our seat at the top table in Europe as an independent nation where I very much hope we will eventually be an equal partner with England because I hope England also stays in the EU.